C L I C K H E R E F O R A CO M P L E T E M O N T H LY C A L E N DA R O F U P CO M I N G E V E N TS AT I N D I A N W E L L S G O L F R E S O RT upCoMing events SUNDAY Bottomless Sunday Champagne Brunch, $34.95. 9 a.m.-2 p.m. MONDAY Wings and bottomless fries with choice of draft beer, $16. 5-9 p.m. TUESDAY Taco Tuesday 2 tacos, margarita, $10. Bucket of 4 Mexican beers, $10 5-9 p.m. WEDNESDAY Half-pound burger & fries with draft beer, well cocktail or house wine, $12. 5-9 p.m. THURSDAY Irish Night. Specials on select Irish food and drink. 50% off bottles of wine. 5-9 p.m. FRIDAY $5 Titos cocktails and $7 Titos martinis. 5-9 p.m. SATURDAY 12-ounce prime rib dinner with potatoes and vegetables, $22. 5-9 p.m. W H AT 'S O N T H E W E E K LY M E N U AT V U E G R I L L E & B A R… L A S T C H A N C E TO S I G N U P F O R T H I S Y E A R 'S E V E N T! 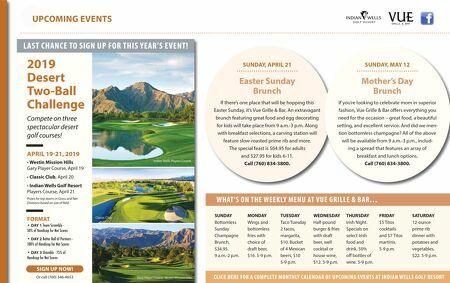 sundaY, april 21 . . . . . . . . . . . . . . . . . . . . . . . . . . . . . easter sunday Brunch If there's one place that will be hopping this Easter Sunday, it's Vue Grille & Bar. An extravagant brunch featuring great food and egg decorating for kids will take place from 9 a.m.-3 p.m. Along with breakfast selections, a carving station will feature slow-roasted prime rib and more. The special feast is $64.95 for adults and $27.95 for kids 6-11. Call (760) 834-3800. sundaY, MaY 12 . . . . . . . . . . . . . . . . . . . . . . . . . . . . . Mother's day Brunch If you're looking to celebrate mom in superior fashion, Vue Grille & Bar offers everything you need for the occasion – great food, a beautiful setting, and excellent service. And did we men- tion bottomless champagne? All of the above will be available from 9 a.m.-3 p.m., includ- ing a spread that features an array of breakfast and lunch options. Call (760) 834-3800.